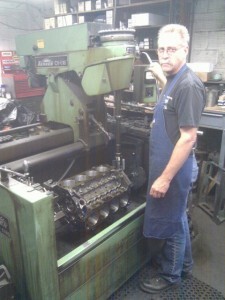 Jack and I visited Wade and Jim at Hubbard Machine in Hayward to drop off Jack’s small block 302 engine for machining and balancing. Hubbard’s was recommended to us by my friend and fellow car club member, Ed Archer, a vintage auto collector and racer who has been a Hubbard’s customer since it was run by Wade’s father-in-law and has known Wade since he was 7 years old. This shop is SERIOUSLY OLD SCHOOL: Wade and Jim are deeply knowledgeable, take great pride in their work, and charge reasonable prices for their excellent service. I wish there were more businesses like Hubbard Machine that were still managed according to these values. Although many of our fellow (and very knowledgeable) gear-heads recommended just buying a crate engine and dropping it in, we decided we’ll get better bang for our buck by machining the block and heads we’ve got and replacing some of the components with new precision parts, matching a new carburetor to the correct camshaft and re-assembling the engine ourselves. Not to mention what a great experience (and time) we’ll have. Consequently, we had the block boiled, cylinders bored and honed, crankshaft ground and polished, valves ground, surfaces (which mate the intake manifold and heads) milled, and had the crank and flywheel balanced. We ordered new cast–not forged–pistons (since we’re not looking to add horsepower with this build), rings, rod- main- and cam bearings, lifters, timing chain set, oil pump kit and gasket set PLUS a couple of cans of Ford Blue high temperature paint. All in (and including the balancing), we paid less than ONE THIRD of what a low-end crate motor would have run us. And it only took about a week and a half for the machining – so Jack better get moving on the engine bay, transmission and rear-end. You are currently browsing the Three Lions Garage archives for September, 2010. 48 mySQL queries in 0.167 seconds.